Besant Technologies - No.1 Rated IT Training Institute in Chennai. We are specialized in Database Developer Training, Database Administration Training, Data warehousing Training, Web Designing Training, SAP Training, Java Training, Software Testing Training, Microsoft Technologies Training, Oracle Applications Training, Mobile Applications Training, Oracle Fusion Middle ware Training, Cloud Computing Training, IBM Training and more. 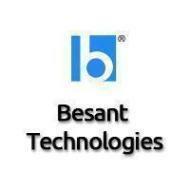 Please step into Besant Technologies to know more at anytime. "I have done my Python with no knowledge about how to code and understanding the analogy of programming, I stepped at the doors of one of the good python institutes, Besant Technologies in Tambaram. I was Interested in learning python so that I could learn data science and machine learning. I can say my tutor was efficient in teaching the concepts well enough for me to understand and implement it. Although, I can say, our commitment to learning is more important for the progress. Anyway, I walked out with skills and knowledge which will benefit my career. Thanks to Besant Technologies Tambaram. One of The Best Python Training In Tambaram. " "I had a great experience in taking the AWS training from Tambaram Besant Technologies at Chennai. It is the only course in the market. Besant Technologies has provided a unique opportunity for the students around the world to connect to some of the best tutors. The tutors only provide real time examples. This gives a edge to the students and the working professional who attend the course.The best advantage of the Besant Technologies course is the fact that we can also attend the course from the comfort of our home as well as download the courses and listen to it over again and again. I am sure that Besant Technologies will be playing a key role in filling the Gap of the Professionals which the Cloud ecosystem is currently facing.One Of The Best AWS Training In Chennai. " "Hi everyone, Extremely happy to complete my Selenium training here. Well before my Selenium course completion.My Trainer, Their teaching was fabulous; I am happy to join this institute. The Class Starts on time. The faculties are well educated and professionals. They are conducting the classes in a proper way, It gives a lot of opportunities to learn & Weekly give Some Sample Projects & Assignments I am totally satisfied with their teaching. I suggested my colleagues And Thank You Besant Technologies Tambaram. One Of The Best Selenium Training In Tambaram "
"Hi, I am gopi With no knowledge about how to code and understanding the analogy of programming, I stepped at the doors of one of the good python institutes, Besant Technologies In Tambaram. I was Interested in learning python so that I could learn data science and machine learning. I can say my tutor was efficient in teaching the concepts well enough for me to understand and implement it. Although, I can say, our commitment to learning is more important for the progress. Anyway, I walked out with skills and knowledge which will benefit my career. Thanks to Besant Technologies Tambaram. " Besant Technologies Tambaram conducts classes in Cloud Computing, DBA and Database Training. It is located in Tambaram West, Chennai. It takes Regular Classes- at the Institute. It has got 1244 reviews till now with 100% positive feedback.